Discussion in 'The Lounge' started by eric strt6, Apr 27, 2010. Mature Mountain Lion cut through my yard this morning and scared the crap out of one of my neighbors out for a jog on the road below me. when the cat dropped off the hill behind my house he cut across the road in front of her then continued into the canyon below. Not at all where I thought this was going. So disappointed. who wants to fight a mountain lion? 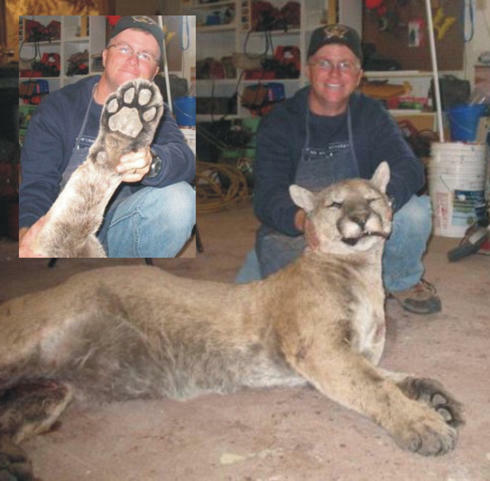 Why do people in CA get all hot and bothered about mountain lions? You've been a little crankier than usual these past few days. Oh I don't know... maybe because they can eat you. very cool sighting for your neighbor . Purely in a sexual way though. I've always wanted to mount a mountain lion and a panda, at the same time.